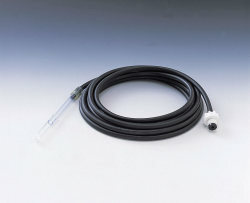 The KITAGAWA Gas Detector Tube System is a complete sampling and analysis system for determining hazardous gas and vapour concentrations quickly and easily. 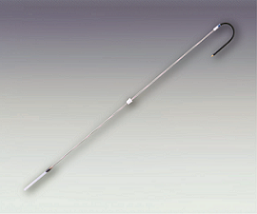 The KITAGAWA Gas Detector Tube System is comprised of an Air Sampling Pump and Precision Gas Detector Tubes. 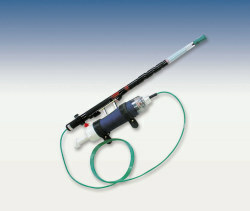 The KITAGAWA air sampling pump reproducibly draws 100cc of sample air through the detector tube. All detector tubes are calibrated for a single pump stroke; there is no need for multiple volumes or stroke counters. Each detector tube is formulated with high purity reagents that absorb and react with the target gas or vapour being measured. A colorimetric stain is created that is proportional in length to the concentration. For most tubes, the concentration is read directly off the measurement scale on each tube. Detector tubes are available to measure more than 200 different kinds of gases and vapours. For many gases and vapours, there are several concentration ranges available giving you the flexibility to measure both low and high concentrations without sacrificing precision. For specific information, please refer to the list of detector tubes. Useful for measurements in hazardous places such as manholes and tanks. 5m (SH-5N) and 10m (SH-10N) in length. Used when measuring gases with high temperatures, such as exhaust gas from a combustion appliance or an automobile. Used to fix the connection of Model AP-20 aspirating pump and Model SF-40 hot air probe to provide much stabler measurements. 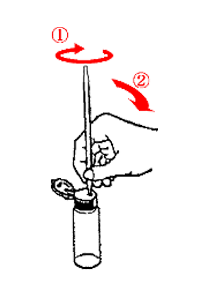 It can be used when measurements are taken in areas that cannot be reached with hand (vertically and horizontally), or when they are taken in hazardous places. The length of the pole is 2m, but measurements can be taken up to about 2.5m if you reach out with your hand. It is also easy to set the gas collector. *The gas collector in the photograph is not included. A probe for a simple check whether chloride organic solvents such as trichloroethylene has polluted the soil. 1. Dig a hole in soil for soil sampling with a boring bar. 2. 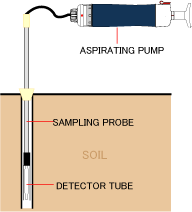 Put a opened detector tube at the top of the sampling probe. 3. Put the sampling probe in the hole first, then connect the probe to aspirating pump. 4. Pull the handle of the aspirating pump to measure Chlorocarbons in soil. *A boring bar is required to dig a hole into the ground. A boring bar for Model SPG-1 sampling probe to dig a hole into the ground for sampling. *1.5m in length, Maximum hole depth 86cm. 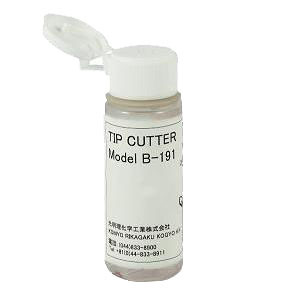 B-191 Tip Cutter in cutting ends of a detector tube avoids scattering of glass fragments. Transparent container easily lets you know the amount of glass fragments. 1. Insert the end of the detector tube into Tip Cutter and rotate by 360 degrees to score the glass tube. 2. Hold the base of the detector tube and pull it toward you. 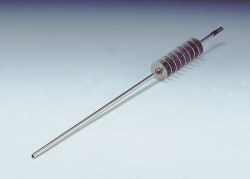 Tip cutter for AP-20 series gas aspirating pumps. Sold as a replacement for damaged or lost tip cutters. *2 pcs in a bag. Connect the NeedlEx to Model AP-20/AP-20N Air Sampling Pump and collect sample gas. You can extract the target compounds selectively in a short time. Heat at the injection port of gas chromatograph can be used for the desorption of extracted gas. 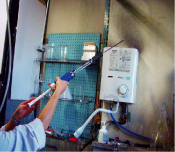 NeedlEx can keep extracted gases for about 10 days with putting teflon plugs to both ends. NeedlEx can be reused about 30 times with 3 minutes conditioning. Click here to download a brochure for the NeedlEx. Designed for generating calibration gas for H2S detection monitors. Calibration Gas Set for Hydrogen Sulphide (H2S-1/H2S-2) is designed for generating calibration gas easily for H2S detection monitors or H2S detector tube. 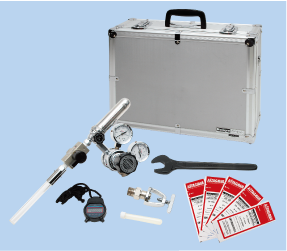 Generate calibaration gas using H2S generation tube, Air pump, calibration bag contained in the kit. You can confirm the concentration of generated calibration gas with the H2S detector tube contained in the kit. Generation tubes, absorbent tubes and detector tubes are for one-time use. Generation Method Absorbing reagent absorbs water and acid is generated, then the acid reacts on celecium sulphide is produced. When disasters occur all of a sudden, it is not uncommon for the rescuer to be hit by a secondary disaster. Among various secondary disasters, toxic gas is extremely dangerous because it cannot be seen. This set enables easy and quick measurements for toxic gases at the place of disaster. In addition to, those included in P-50 set, the following 20 kinds of detector tubes are included. One of the main cause for deterioration of reinforced concrete durability is the salinity. It has become a big problem as beach gravel is used more and more often. To cope with this problem, Ministry of Construction has announced a regulation in the total amount salinity in concretes in the notification of measures in relation to achieving concrete durability. P-30CL and P-30CL2 lets you measure the salt concentration in ready-mixed concrete or the fine aggregate quickly and accurately. The salinity detector tube SL types used for this purpose, are quality evaluated product (No.860801) by Japan Institute of Construction Engineering. 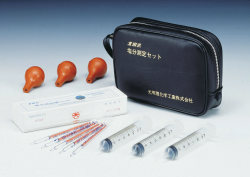 ●3 syringes　●3 rubber balls　●30 SL type salinity detector tubes　●elastic case. 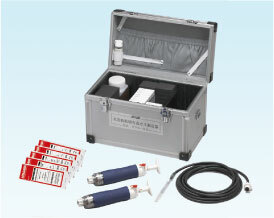 ●3 syringes　●3 rubber balls　●30 SL2 type salinity detector tubes　●elastic case. When impurities exist in the compressed air for respiration, it affects human health. P-41R enables you to easily measure the impurities in compressed air by aerating the detector tube with an exclusive reducing valve from the gas cylinder.